Heat the stock in a large saucepan over medium heat. In a separate saucepan melt the butter over medium heat. Add the onion and cook for 5 minutes or until softened. Add the rice and wine and cook, stirring, for 1–2 minutes or until all the wine is absorbed. Gradually add the hot stock, 1 cup (250ml) at a time, stirring continuously, for 25–30 minutes or until all the stock is absorbed and the rice is tender. Spread the risotto onto a tray and allow to cool slightly. Add the mozzarella, parmesan, salt and pepper, peas, mint, lemon juice and lemon rind and mix to combine. Shape teaspoonfuls of risotto mixture into balls, dip into the flour and egg and toss in the breadcrumbs until well coated. Repeat the process to double coat the balls. Heat oil in a large, deep saucepan over high heat until hot. 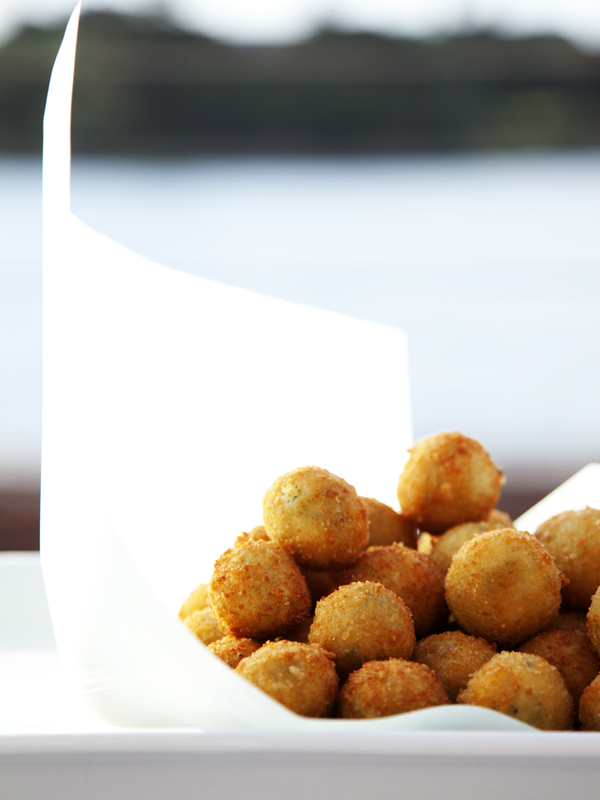 Deep-fry the risotto balls, in batches, until crisp and golden. Drain on absorbent paper. Makes 18.